Verdict: The latest addition to the emerging ‘screen movie’ genre transcends its gimmick to become an engrossing thriller. As with films like Rope (1948), The Blair Witch Project (1999) and Tangerine (2015), Aneesh Chaganty’s debut feature Searching is destined to be remembered more for its technical gimmick than its content. Which seems a shame – sure, this will go down as ‘that film set on a computer screen’, but that shouldn’t take away from the fact it’s also a skilfully executed whodunit and a family drama with real heart. The film begins with an extended montage that efficiently speeds us through the love story between David (John Cho) and Pam Kim (Sara Sohn), the childhood of their daughter Margot (Michelle La) and Pam’s diagnosis with a terminal case of lymphoma, all told via the shared household computer. It’s a digital riff on the celebrated opening of Pixar’s Up (2009), making use of home videos, emails and calendar reminders – ‘Mom comes home’ is repeatedly moved forward, then deleted – to poignantly sketch the family tragedy that the film rests on. The narrative picks up a few years later with David constantly on his laptop, distracting himself by browsing through photos and videos that remind him of happier times. Though his relationship with his now teenage daughter Margot is perfectly pleasant, their stilted message chain hints at a strain between them. When David awakes one morning to three missed calls from Margot and her phone going straight to voicemail, his initial reaction is annoyance that she didn’t take the bins out before school. But when he realises she never made it home the previous night, and discovers that she’s being lying to him about her whereabouts for some time, David starts to fear the worst. Instructed by the sympathetic Detective Vick (Debra Messing) to gather as much information on Margot as possible, David’s desktop becomes his investigation board on which he pins the various browser windows that may contain clues to his daughter’s whereabouts. For over 20 years, Hollywood films have struggled to represent the internet – let alone social media – in cinematically compelling ways. Searching isn’t the first film to entirely tether its action to screens (the 2014 films Open Windows and Unfriended got there first) but it is the first to convincingly pull it off. Chaganty finds beauty in a screensaver gif, and even has time for some good old internet nostalgia (‘The Maze Game’, anyone?). And it’s a narrative marvel that David’s detective work, confined to computers, phones, news reports and security footage, never feels contrived – an indication, perhaps, of the ubiquity of screen culture. 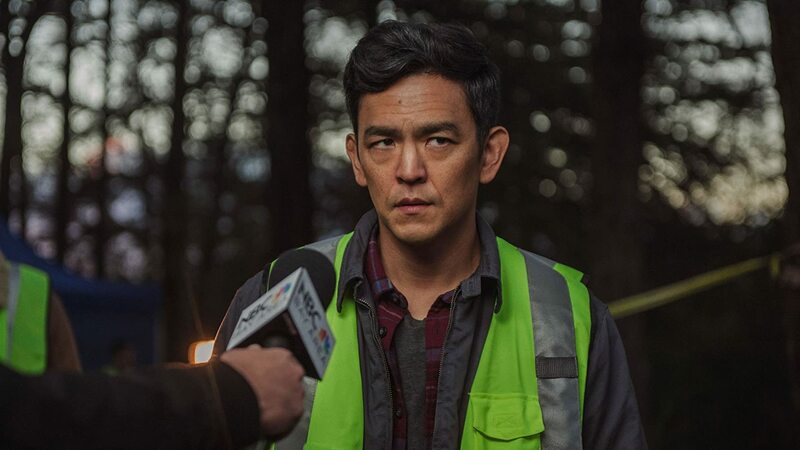 The ever-excellent John Cho is entirely convincing in the role of distressed dad. David does a lot of point-and-clicking through various websites, so it’s testament to the engagingness of Cho’s performance, as well as some inventive editing, that the film doesn’t feel overly procedural. Searching also avoids the film cliché of the technophobe parent, without skipping over the generational gap that the internet amplifies – ‘what’s a tumbler?’ he bewilderedly asks. As relatively tech-savvy as he is, David finds himself completely lost as he tries to follow the digital breadcrumbs his daughter left behind. ‘I didn’t know her’ he confesses, faced with the realisation that the second life we live on the internet doesn’t necessarily mirror our outer world. If it all sounds a bit ominous, that’s because Chaganty doesn’t shy away from the ugly side of the web, like the hypocrisy of her uncaring schoolmates pretending to love Margot when it suits their online image, or like the hell David goes through when #DadDidIt starts trending on online forums. Thankfully, it never reaches Black Mirror levels of sinister. In so many recent films the internet is associated with teens mindlessly scrolling down the bottomless pit of their Instagram feed. So it’s refreshing that Searching focuses in on the little human details, like how David adds a full stop to his messages and Margot doesn’t, how he hopelessly types, deletes and re-types his messages to her again and again. Set against the backdrop of information overload, the film reminds us that all the answers are right in front of us, so long as we look a little closer. Plot wise, it’s a fairly traditional thriller, and like so many of those films brandishes one twist too many in its slightly silly finale. And no, this film probably won’t make sense to your grandparents, or anyone much at all in fifty years’ time. But as a distinctly contemporary mystery, Searching is a masterclass in storytelling for the digital age – and a whole load of fun. Searching releases August 31st, distributed by Sony Pictures.